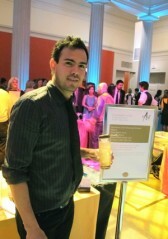 Ronald Flores of Art and Soul with his ARTINI Coleman's Juice. Photo by author. Congratulations to Ronald Flores of Art and Soul, who was awarded the Critics’ Choice at Saturday night’s ARTINI 2011 celebration at the Corcoran Gallery of Art. The intrepid We Love DC drinks team had been following the entries closely every week with our Friday Happy Hours, and congratulations are really due to all the competing mixologists. It was an honor for me to serve on the judging panel alongside last year’s winner Justin Guthrie (now Estadio’s general manager), Todd Thrasher of Restaurant Eve/PX, Corcoran’s assistant curator for contemporary art Beatrice Gralton, Washingtonian editor Sophie Gilbert, and notable chef Mike Isabella of the soon-to-open Graffiato. It was an extremely tight race! Flores’ cocktail was inspired by William Christenberry’s sculpture Coleman’s Cafe and was crafted with Gentleman Jack Tennessee whiskey, mezcal, yuzu-agave syrup, rhubarb bitters, and housemade vanilla cola. Garnished with a housemade Slim Jim (which honestly I mistook for a half-smoked cigar upon first sight, a nice homage to Christenberry’s shack of a cafe), the drink was called Coleman’s Juice and had a distinctly smoky flavor. The evening was filled with gorgeous guests (seriously, anyone who still thinks Washington is “Hollywood for ugly people” needs to get to next year’s ARTINI and be blown away by the eye candy!) in the beautiful classical surroundings of the Corcoran. I’ll detail the other very worthy contestants and wrap up my experience later this week in Thursday’s We Love Drinks.